One thing New York City does not lack is public art. 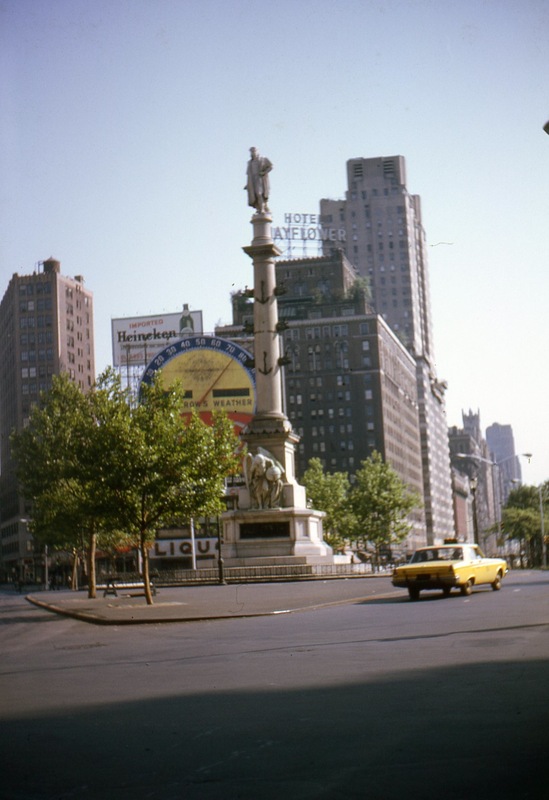 In Columbus Circle on the South West corner of Central Park stands a memorial to Italian Explorer, and “Discoverer of America,” Christopher Columbus. This one took me a bit of time to track down. I knew I’d seen the statue before, but was not able to quickly find it. Part of the problem is that all the buildings in the background have been torn down and removed. The second part was that the “circle” in this picture is much smaller then it is now. The statue in the circle is of Christopher Columbus. It was erected as part of New York City’s four hundredth celebration of his landing in the Americas. There were major revocations to the circle in 2005, perhaps that is when it grew in size? The Mayflower Hotel in this picture looks like it was torn down in 2004. An Twin Tower residential building was built in it’s place. But even that building looks to have been heavily renovated since the original 1965 picture above.